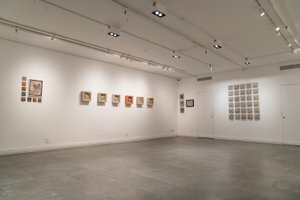 This newly renovated, multi use space in SoHo is ideal for almost any event including an Art Opening, a Pop-Up Store, a Product Launch or a Private Event. The space is divided into two levels: a ground level, retail space and a gallery space in the level below. Also available at this location is a large office and a storage/stock room. There are also two shopping/meeting rooms in the lower level. The space is completely white box and move-in ready. And a great feature of the space is the large window display that is ideal for advertising your brand or event. The entire space can also be emptied if the it is desired. The space is brand new with full amenities, such as high-speed internet, a restroom, security system, sound & video equipment, etc. There is also furniture including office equipment that is available for you to utilize. 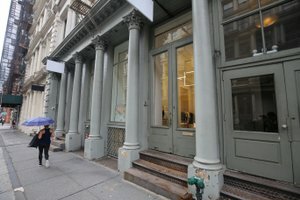 The Neighborhood: SoHo is popular option for anyone that loves to shop. 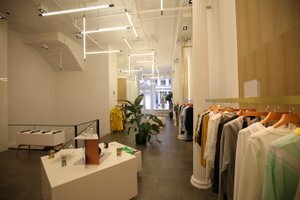 With designer boutiques to chain retail, SoHo is lined with options for shopping that makes it a popular destination for tourists and locals alike. This is a picturesque area with cobblestone streets and cast-iron architecture everywhere and creates a great atmosphere that attracts artists and shopper alike. This is a high-foot traffic area and it’s easy to find great galleries and restaurants as your walk around. 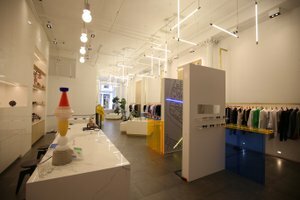 Overall, SoHo is a great neighborhood for the chic and trendy. 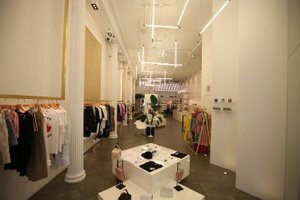 This space is surrounded by boutiques such as ZARA, lululemon, Patagonia, Acne, Chanel, and adidas.